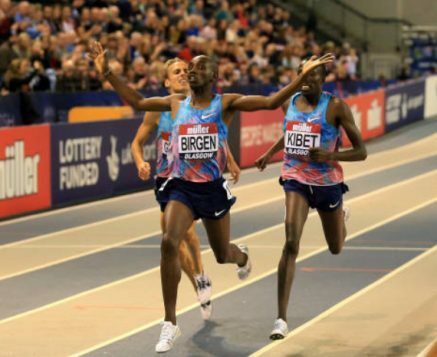 10th February 2019 – World Indoor bronze medallist Bethwel Birgen (KEN) once again showed how at home he is on the boards with victory over 1500m at the IAAF World Indoor Tour meeting in Madrid. Already sitting at the top of the tour standings before this race Bethwel extended his lead with 10 more points here, crossing the line in 3:40.17. Training partner Vincent Kibet (KEN) was unlucky to be tripped with 200m to run when well placed to challenge. Winny Chebet (KEN) ran her first race of the indoor season in the women’s 1500m and was fourth in 4:13.38. In the US, Laura Roesler (USA) made a very strong statement about how well her winter training is going with a solo sub 2-minute clocking for 800m at the BU David Hemery Valentine Invite. Leading from gun to tape Laura ran 1:59.80 for an indoor PB and the fifth fastest time in the world this year. On the roads, in his first race of 2019 Emmanuel Bett (KEN) took second place at the New Orleans Half Marathon. In a competitive race Emmanuel just lost touch with the winner Dathan Ritzenhein in the last 400m timing 61:30 to the winners 61:24.